Fornhill and Story Stratford Highways, Bill. Passage to Palace Yard, through The Gatehouse, Bill. Sir Thomas May's Report delivered. Betts' Consent to be a Trustee in Hide's Bill. Sir T. Parker's Consent to be a Trustee in William's Bill. Epus. Dunel. & D. Crew. Epus. Landaven. Ds. Custos Magni Sigilli. Hodie 3a vice lecta est Billa, intituled, "An Act for the better securing Her Majesty's Purchase of Cotton House, in Westm'r." 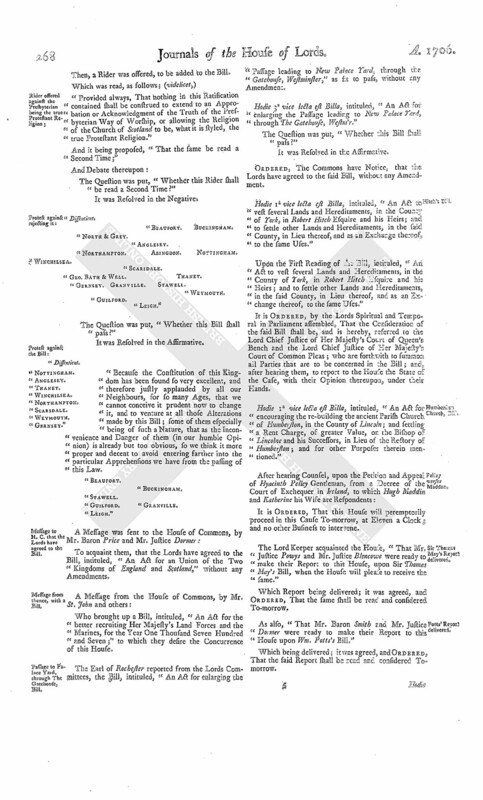 Who brought up a Bill, intituled, "An Act for repairing the Highway between Fornhill, in the County of Bedford, and the Town of Stoney Stratford, in the County of Buckingham;" to which they desire the Concurrence of this House. Hodie 1a vice lecta est Billa, intituled, "An Act for repairing the Highway between Fornhill, in the County of Bedford, and the Town of Stoney Stratford, in the County of Buckingham." Hodie 3a vice lecta est Billa, intituled, "An Act for vesting Part of the Estate of William Fitch Esquire, lying in the County of Dorset, in Trustees, to be sold, for Payment of his Sister's Portion, and other Debts; and for preserving the Residue free from all Power of Waste; and for settling certain Tithes in the Isle of Wight to the same Uses." Who brought up a Bill, intituled, "An Act to enable Henry Pye Esquire to make a Jointure;" to which they desire the Concurrence of this House. Hodie 3a vice lecta est Billa, intituled, "An Act for an Union of the Two Kingdoms of England and Scotland." Then, a Rider was offered, to be added to the Bill. "Provided always, That nothing in this Ratification contained shall be construed to extend to an Approbation or Acknowledgment of the Truth of the Presbyterian Way of Worship, or allowing the Religion of the Church of Scotland to be, what it is styled, the true Protestant Religion." And it being proposed, "That the same be read a Second Time;"
The Question was put, "Whether this Rider shall be read a Second Time?" "Because the Constitution of this Kingdom has been found so very excellent, and therefore justly applauded by all our Neighbours, for so many Ages, that we cannot conceive it prudent now to change it, and to venture at all those Alterations made by this Bill; some of them especially being of such a Nature, that as the Inconvenience and Danger of them (in our humble Opinion) is already but too obvious, so we think it more proper and decent to avoid entering farther into the particular Apprehensions we have from the passing of this Law. 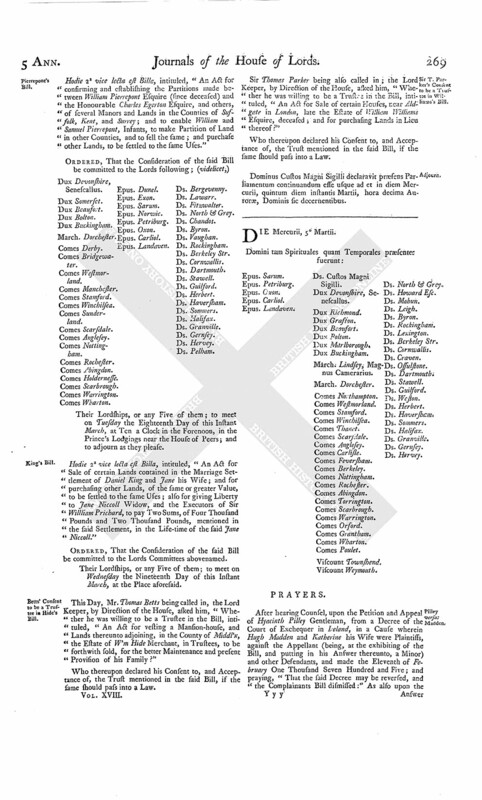 To acquaint them, that the Lords have agreed to the Bill, intituled, "An Act for an Union of the Two Kingdoms of England and Scotland," without any Amendments. Who brought up a Bill, intituled, "An Act for the better recruiting Her Majesty's Land Forces and the Marines, for the Year One Thousand Seven Hundred and Seven;" to which they desire the Concurrence of this House. The Earl of Rochester reported from the Lords Committees, the Bill, intituled, "An Act for enlarging the Passage leading to New Palace Yard, through the Gatehouse, Westminster," as fit to pass, without any Amendment. Hodie 3a vice lecta est Billa, intituled, "An Act for enlarging the Passage leading to New Palace Yard, through The Gatehouse, Westm'r." Ordered, The Commons have Notice, that the Lords have agreed to the said Bill, without any Amendment. Hodie 1a vice lecta est Billa, intituled, "An Act to vest several Lands and Hereditaments, in the County of York, in Robert Hitch Esquire and his Heirs; and to settle other Lands and Hereditaments, in the said County, in Lieu thereof, and as an Exchange thereof, to the same Uses." Upon the First Reading of the Bill, intituled, "An Act to vest several Lands and Hereditaments, in the County of York, in Robert Hitch Esquire and his Heirs; and to settle other Lands and Hereditaments, in the said County, in Lieu thereof, and as an Exchange thereof, to the same Uses." 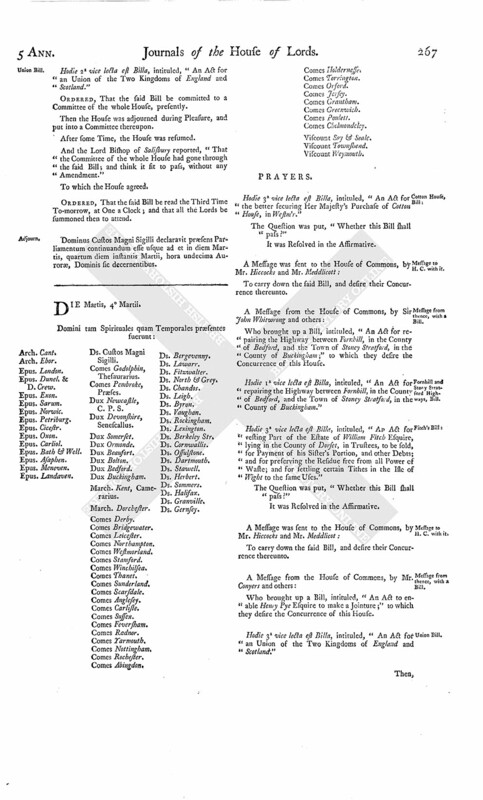 It is Ordered, by the Lords Spiritual and Temporal in Parliament assembled, That the Consideration of the said Bill shall be, and is hereby, referred to the Lord Chief Justice of Her Majesty's Court of Queen's Bench and the Lord Chief Justice of Her Majesty's Court of Common Pleas; who are forthwith to summon all Parties that are to be concerned in the Bill; and, after hearing them, to report to the House the State of the Case, with their Opinion thereupon, under their Hands. Hodie 1a vice lecta est Billa, intituled, "An Act for encouraging the re-building the ancient Parish Church of Humberston, in the County of Lincoln; and settling a Rent Charge, of greater Value, on the Bishop of Lincolne and his Successors, in Lieu of the Rectory of Humberston; and for other Purposes therein mentioned." It is Ordered, That this House will peremptorily proceed in this Cause To-morrow, at Eleven a Clock; and no other Business to intervene. The Lord Keeper acquainted the House, "That Mr. Justice Powys and Mr. Justice Blencowe were ready to make their Report to this House, upon Sir Thomas May's Bill, when the House will please to receive the same." Which Report being delivered; it was agreed, and Ordered, That the same shall be read and considered To-morrow. As also, "That Mr. Baron Smith and Mr. Justice Dormer were ready to make their Report to this House upon Wm. Potts's Bill." Which being delivered; it was agreed, and Ordered, That the said Report shall be read and considered Tomorrow. Hodie 2a vice lecta est Billa, intituled, "An Act for confirming and establishing the Partitions made between William Pierrepont Esquire (since deceased) and the Honourable Charles Egerton Esquire, and others, of several Manors and Lands in the Counties of Suffolk, kent, and Surrey; and to enable William and Samuel Pierrepont, Infants, to make Partition of Land in other Counties, and to sell the same; and purchase other Lands, to be settled to the same Uses." Their Lordships, or any Five of them; to meet on Tuesday the Eighteenth Day of this Instant March, at Ten a Clock in the Forenoon, in the Prince's Lodgings near the House of Peers; and to adjourn as they please. Hodie 2a vice lecta est Billa, intituled, "An Act for Sale of certain Lands contained in the Marriage Settlement of Daniel King and Jane his Wife; and for purchasing other Lands, of the same or greater Value, to be settled to the same Uses; also for giving Liberty to Jane Niccoll Widow, and the Executors of Sir William Prichard, to pay Two Sums, of Four Thousand Pounds and Two Thousand Pounds, mentioned in the said Settlement, in the Life-time of the said Jane Niccoll." Ordered, That the Consideration of the said Bill be committed to the Lords Committees abovenamed. Their Lordships, or any Five of them; to meet on Wednesday the Nineteenth Day of this Instant March, at the Place aforesaid. This Day, Mr. Thomas Betts being called in, the Lord Keeper, by Direction of the House, asked him, "Whether he was willing to be a Trustee in the Bill, intituled, "An Act for vesting a Mansion-house, and Lands thereunto adjoining, in the County of Middl'x, the Estate of W'm Hide Merchant, in Trustees, to be forthwith sold, for the better Maintenance and present Provision of his Family?" Who thereupon declared his Consent to, and Acceptance of, the Trust mentioned in the said Bill, if the same should pass into a Law. Sir Thomas Parker being also called in; the Lord Keeper, by Direction of the House, asked him, "Whether he was willing to be a Trustee in the Bill, intituled, "An Act for Sale of certain Houses, near Aldgate in London, late the Estate of William Williams Esquire, deceased; and for purchasing Lands in Lieu thereof?" Dominus Custos Magni Sigilli declaravit præsens Parliamentum continuandum esse usque ad et in diem Mercurii, quintum diem instantis Martii, hora decima Auroræ, Dominis fic decernentibus.